With 3D isometric environments, surreal but attractive graphics, catchy music and original gameplay, ‘Snake Rattle N Roll’ is often considered a NES hidden gem. However it seems everyone has forgotten the enhanced Mega Drive port. Maybe there’s a reason for this? I was recently at the London Play Expo and was very excited to see a Mega Drive re-release of one of my favourite NES games: ‘Snake Rattle N Roll’. My perception of game quality was somewhat skewed back in my youth. In my defence, it’s hard to be that objective when you have a shallow pool of knowledge. I could only play the games I owned or borrowed from friends, I simply didn’t have access to thousands of games like I do now. As such, a favourite game wasn’t necessarily the best on a system; it was just one of the better games that I could play. ‘Snake Rattle N Roll’ had lingered in my memory predominantly because it was just so different to the other titles I owned. The game’s varied viewing angle and downright bizarre sense of humour made it memorable. As we grow up we have a tendency as adults to believe that recollection is a barometer of quality. If we can remember a game so vividly it must be good. So at the Gaming Expo I was shocked that the others with me were not as excessively excited to see a fondly remember NES game now available with 16 bit graphics. I didn’t understand their ambivalence, but as their game playing youth hadn’t included this avant-garde snake based platform puzzler, they simply saw it as yet another game. It dawned on me that my love for ‘Snake Rattle N Roll’ and my eagerness to play it with updated graphics was unique to me. They had no nostalgia for it and instead had objectivity that I lacked. They could check the opinion of others and read that it’s actually a ridiculously frustrating and flawed game. It has novel ideas but they’re badly implemented. This wasn’t what I remembered so I bought the 16 bit update; convinced that a great NES game would become a superb Mega Drive game. As is always the case, nostalgic memories had been selective. ‘Snake Rattle N Roll’ isn’t the flawless fun game I remember and I wondered if my friends were actually right to not want to spend too much time or money playing it. The aim of this unashamedly surreal game is to guide two snakes called Rattle and Roll, to the top of a mountain. Although the box may boast “brilliant 3D graphics’, like ‘Sonic 3D’ this claim comes from the fact that ‘Snake Rattle N Roll’ has isometric levels. However, unlike similar looking Sega games starring blue spiky hedgehogs, each stage in this game features a locked door and a weighing scale. For some inexplicable reason, the door only opens once the snakes have gained enough bulk to make the Bell on the weighing scale ring. To gain weight they need to get longer and to do this they must eat little balls called “Nibbley Pibbleys". These come in three flavours and typically bounce, fly, run or swim around a level. As the scale can weigh two snakes simultaneously, it’s implied that ‘Snake Rattle N Roll’ is a game that’s best played with a friend. However, every stage can be completed alone (but a solitary snake will just have to eat twice as much to make the Bell ring). The quickest way to do this is to position yourself near one of the dispensers that are peppered throughout the stage. They randomly launch additional Nibbley Pibbleys, however, they also spew out bombs which can damage a snake. Taking damage from these or from any one of the other bizarre opponents reduces the length of the snakes’ tail. A snake will die if they are hit without a tail so it’s always worth eating every Nibbley Pibbleys you come across. After all, there’s no penalty for being the proud owner of an excessively long snake. 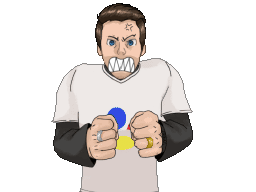 To avoid taking damage, Players can defeat enemies by lapping their tongue against them or by bouncing on them. Various pickups can even be found around the levels including extra lives, bonuses that extend the tongue and also a clockwork key that increases movement speed. These upgrades are often found off the beaten track which encourages level exploration. There are also many manhole covers in stages, which can be lifted. Sometimes these conceal entrances to bonus stages, restart points and maybe even warp to later stages. With opponents that include toilet seats, sharks and Monty Python-esque giant feet ‘Snake Rattle N Roll’ is certainly an odd game. Although it was co-created by Rare owner Tim Stamper, most of the ideas reportedly came from Mark Betteridge. 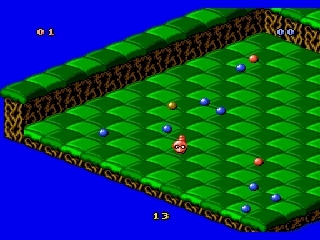 Betteridge would later go on to replace Stamper as head of Rare, but at the time, he was a programmer and fan of the isometric arcade game ‘Marble Madness’. according to colleague Brendan Gunn, ‘Snake Rattle N Roll’ was the result of Betteridge attempting to create a game that looked like ‘Marble Madness’ but one that could also fit on the smallest NES Cartridge available . Incidentally, the game was later used as the basis for Rare’s proposed NES port of ‘Marble Madness’. Nintendo Power compared the game to ‘Q-Bert’, mainly because of the angle the game is viewed at. Sadly, ‘Snake Rattle N Roll’ suffers from the typical control issues that come from isometric games. While the arcade game ‘Q-Bert’ is played with a joystick, the D Pad used to control ‘Snake Rattle N Roll’ is at a different orientation to the game world. As a result it isn’t immediately obvious which button is required for each direction. You’ll eventually get used to it but as the levels progress a player faces more complex jumps often over spikes that kill in a single hit. As with so many isometric games it’s hard to tell where floating platforms sit within the game World. When a level is a solid land mass things are less of an issue, but too often I found myself failing a jump simply because I couldn’t make sense of a stages’ geography. Shadows give an indication of where you’ll land but that only really helps if you’ve made a jump in the correct direction initially. It’s far too easy to get disoriented, perceiving things to be parallel with your snake when really they’re higher up and further out. As critic Paul Glancey said at the time “the control method is pretty poor in that it is often confusing”. In his Mean Machines review Glancey notes “the problem is worsened by the strange perspective [...] and so an unexpected demise is a regular occurrence”. The controls certainly don’t help matters mainly because they are so incredibly slippery; perhaps because you’re playing as a Snake. While this is logical, it isn’t ideal in a game where precision is required. Each character seems to have far too much momentum and will continue to move after a button is released. When you plummet onto spikes through no fault of your own it can make the playing experience frustrating. ‘Snake rattle n roll’ isn’t hard because the levels demand too much from a player. Often you can see where you need to go and optimal route to get there. The game’s challenge seems to be because successfully pulling off the actions required is excessively demanding. It’s comparable to a game like ‘Octodad’ where the protagonist himself seems reluctant or unable to follow the player’s instructions. Tighter responsive controls would make playing ‘Snake Rattle N Roll’ so much more enjoyable and the fact that these control issues were carried over to the Mega Drive port suggests it was an ill-advised design intention. Rich Leadbetter even claimed that the Mega Drive controls are “a lot less forgiving” than the NES version. It’s a Shame that Rare didn’t address the control issues in this optimised version; critics were pretty vocal about what was wrong with the original game. Considering Rare’s close relationship with Nintendo it is surprising that ‘Snake Rattle N Roll’ was ported to the Mega Drive and not the Super Nintendo. Released only in Europe, while it had the same flawed controls this port featured an additional final level on top of the 11 levels in the NES version. The short extra stage actually feels like a bizarre epilogue as it takes place after the NES version’s ending. At the end of both games Rattle and Roll reach the top of the mountain, climb into a space ship and launch into space. In the Mega Drive game a meteorite crashes into their spaceship, causing them to crash-land onto another planet. 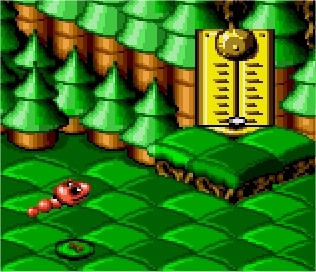 Escaping this planet is the basis of the Mega Drive’s 12th level. It includes enemies unique to this stage, but the exclusive level is so ridiculously hard you’ll probably wish it didn’t exist in the first place. It really does emphasise what’s bad about the gameplay: it has too many leaps onto small targets that are hard to judge owing to the isometric view. It also has falls that'll kill you and others that won’t without any distinction between the two. To make matters worse there’s a time limit on this stage that’s so tight that it feels a single mistake means the level is impossible to finish in time. Despite its unfair exclusive level, the Mega Drive Version of ‘Snake Rattle N Roll’ still remains the best version. Today it would be called a re-master as it’s essentially the same game but with a graphical overhaul. Like ‘Super Mario All Stars’ and ‘Mega Man The Wily Wars’ an 8 bit game has been given a 16 bit lick of paint and the impressive abstract stages look all the better for it. The increased colour palette means the snakes and their opponents do not blend into the environments as easily. Of course the all too familiar NES flicker has gone and the bonus hidden rooms now resemble Nibbley Pibbley ball pools as the Mega Drive can show many more sprites on screen at once. Some reviewers felt that the visuals on the Mega Drive weren’t a big enough leap from the same game on the inferior NES though. “[Greater] attention paid to improving the game's looks and music would have increased its appeal” notes Mean Machines magazine. “Side by side there’s hardly any difference between the NES and the Sega game” adds CVG magazine. For me it looks as good as it could do while still remaining faithful to the original. It doesn’t push the Mega balDrive, but in a game like this, visual clarity is important and too much unnecessary window dressing may have ultimately become distracting. Even without excessive visual flourishes, Critic Julian Rignall still called the Mega Drive version "stunning, with beautifully drawn scrolling forced perspective 3D backdrops and some great sprites". Like many of Rare’s 8bit and 16 bit titles, this game has a great soundtrack. According to composer David Wise “‘Snake Rattle N Roll’ was heavily influenced by '50 rock and roll” which isn’t that surprising considering the pun in the title. Although Wise’s work on the ‘Donkey Kong Country’ Games would make him Rare’s most famous song smith, his involvement in ‘Snake Rattle N Roll’ was minimal. That being said, it was indicative of the game creation culture in the eighties. Perhaps because it was made at a time when copyright infringement was a greater concern, the majority of music in the Mega Drive version has been changed. The new tracks really are no better or worse than the NES games’; still inspired 1950s style rock and Roll only less similar to recognisable classics. The game sounds great regardless of the system it’s played on, and it does make a change from the snarling electronic guitar music you typically associate with 16 bit Sega games. Despite the Mega Drive version of ‘Snake Rattle N Roll’ being superior visually, it’s strange that it’s the NES version that gets remembered by critics. IGN ranked the game at 32 in its "Top 100 NES Games" list, calling it "another of Rare's excellent pre-second-party efforts on the NES”. The Game didn’t however make it into an equivalent Mega Drive list. Retro Gamer magazine called it "an essential NES game" but again neglected to praise the 16 bit Sega version. Games TM said the game was one of the more unheralded games in the NES library. If this is the case you have to wonder how forgotten the Mega Drive has become, since this magazine didn’t even acknowledge its existence in a feature. Capcom never includes the Mega Drive’s ‘Mega Man: The Wily Wars’ in compilations, instead they favour the original NES games. Rare did exactly the same thing with their 2015 ‘Replay Collection’. It was the NES 8bit game that was included even though the superior 16bit graphics and lack of sprite flicker would probably have made the Mega Drive’s ‘Snake Rattle N Roll’ more desirable to players unfamiliar with the game. Were I to play ‘Snake Rattle N Roll’ it’s the Mega Drive version I go for. If for no reason other the end of each level score screen. 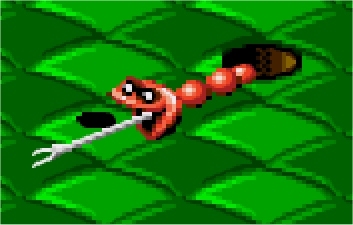 In the Mega Drive version, the snake that ate the least Nibbley Pibbleys gets attacked by the winning snake. It’s silly, irreverent and random but that makes it in keeping with the rest of the game. Whichever system you play it on ‘Snake Rattle N Roll’ is a potentially great game, that’s hurt by poor controls and a level 7 difficult spike. With enough patience there’s fun to be had, and at least there’s some jaunty music to enjoy while you practice. As Polygon puts it “this weird-as-hell platformer is hampered a little by its bizarre isometric viewing angle, but then that's also part of the charm.” According to the website “‘Snake Rattle N Roll’ is absolutely worth checking out if you've never played it before, which basically includes anyone who either missed the 80s or spent it outside of the UK”. The World, I must remember, didn’t have exactly the same gaming childhood as me.